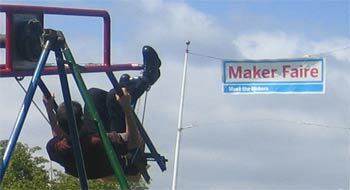 On Sunday, April 23rd, Stacy, June and I drove down to San Mateo, CA, to visit the Maker Faire. 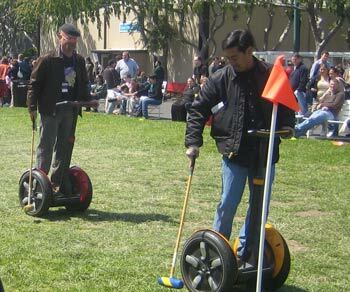 It was the first one of its kind, so no one really knew what to expect, but it seemed like it had the potential to be a very interesting get-together. It was about a two-hour drive, and tickets were $12 each. 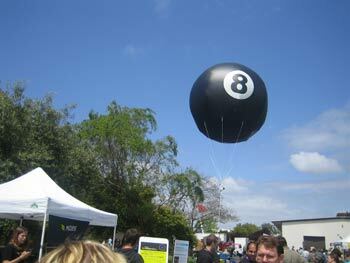 The first thing we saw was a giant eight-ball balloon tethered to the Mozes tent. We received our dashing new canvas Maker Totes! 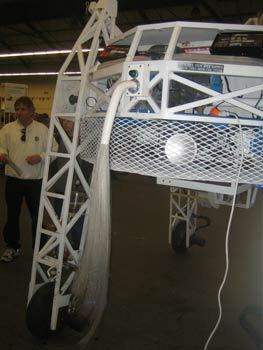 Inside Maker Hall A, almost the first thing I came across was this dragon robot with an impressive tail of optical fiber! I cut this off and stuffed it into my new canvas Maker tote. Fiber optic problem solved! 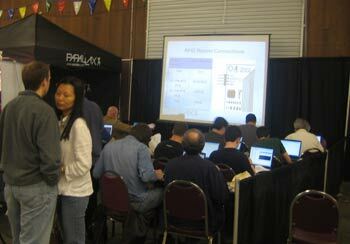 This next picture is of the Parallax microprocessor presentation. These are a well-known basic platform for controlling robots. The audience was taking notes like madmen. 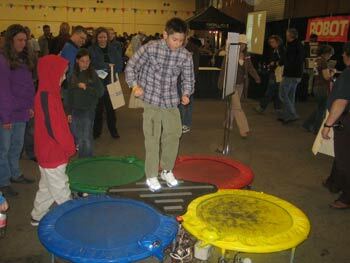 Just next door, a crowd was gathered at this SIMON-based trampoline game. The trampolines would flash a sequence, and the jumper had to bounce around, following the same sequence. It was excellent! 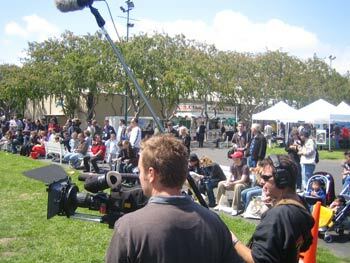 The Mythbusters traveled with pretty good camera and sound equipment. 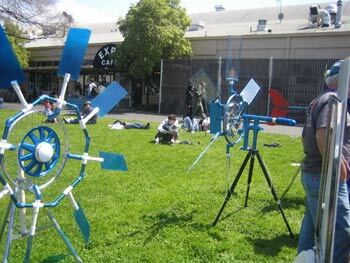 Another outdoor exhibit were these simple bicycle wheel windmills. There was nothing spectacular about them, but they made everyone who walked by smile, myself included.